Northwest Automatic Level kit #NCLP32X with tripod and 9ft level rod in Eighths. Northwest NCLP32X Auto Level kit with tripod and 9ft level rod in Eighths For contractors who demand professional performance, NCL series are the right choice. They are all equipped with high quality magnetic dampened compensators. NCL auto levels are built to sustain rough environment at any job site, they are ideal for leveling and grading applications on jobs like foundations, driveways, pools, pipe laying and general landscape. NCL Series auto levels 32x. They are also available in packages which include: NCL automatic level, NAT83 tripod and NAR09E Rod. Includes: Carrying Case, Plumb Bob & Manual Magnification 32x Working Range 400 ft Leveling Accuracy 1/16" @ 150 ft ft For contractors who demand professional performance, with high performance magnetic dampened Compensators. NCL series levels are built to sustain the rough environment at any job site, they are ideal for leveling and grading applications on jobs like foundations, driveways, pools, pipe laying and general landscape. 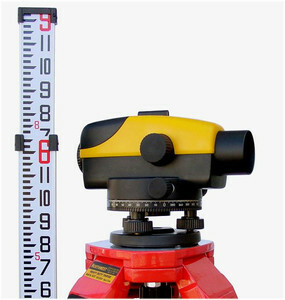 KIT INCLUDES LEVEL, TRIPOD, AND 9 FT LEVEL ROD. We carry several different versions of rotary lasers including the Northwest NRL602, NRL800, NRL800X digital, and the NRL802. These ensure you avoid the hassle of inaccurate measurements and with features like one touch operation, and slope matching, you can choose the product that matches your needs. For a high performing laser, we recommend the Gradoplane rotating laser which features single or dual grade control, automatic electronic self leveling and two-way removable remote control.